Roses are the most popular of decorative flowers, immortalized in song and poetry for centuries. Roses are often cut and displayed in the home as a beautiful decoration. 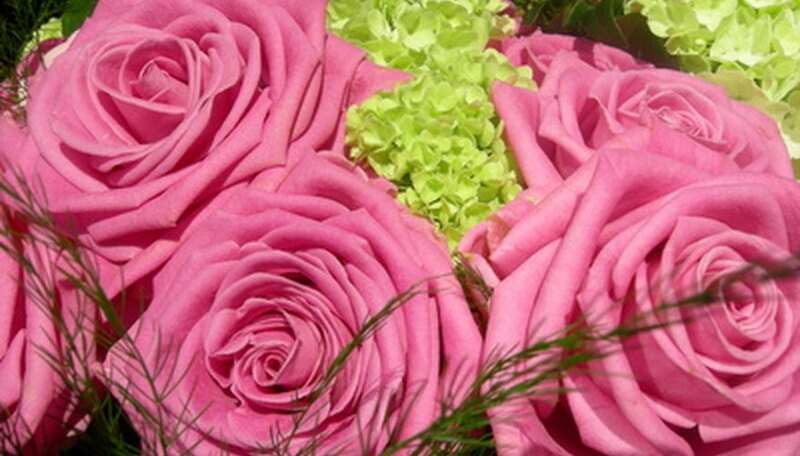 Cut flowers eventually die, but the addition of sugar water may delay the process, preserving the flowers for up to several weeks with the right care. Choose the correct roses for preservation in sugar water for success. Look for roses that have only the first or second layer of the pedals loose. Inspect the sepals to see if they turn downward towards the stem. Do not cut roses that re-closed or appeared loose. Large amounts of carbohydrates are required for the preservation of flowers in a vase, according to the National Institute of Floriculture. Sugar water provides simple sugars, which act as carbohydrates, feeding the rose and reducing decay of the flower. Treatment with a sugar water as well as a hydroxyquinoline compound, available at garden centers, will increase the life of the cut rose. The University of Illinois extension offers a recipe for sugar water that will extend the life of your cut roses. Add 2 tbsp. of white vinegar, 2 tsp. of sugar, and 1/2 tsp. of bleach to 1 quart of warm water. Alternatively, 1 pint of regular lemon or lime soda is mixed with 1/2 tsp. of bleach and 1 pint of warm water. Prepare the roses properly before placing them in the sugar water to help prolong life. All leaves on the rose stem are removed to conserve energy. One inch is cut off the stems, at a 45-degree angle using a sharp knife to prevent crushing the stem. Place the vase in an area where there are no extreme heat or weather changes. Check the water level often. When the mixture gets low change the water. Remove the roses from the water and wash the stems. Recut the stem and place the roses into the new sugar water.